We are in the season of “change”. I don’t what this will mean, ultimately. But I do know that I can resist change – or ride along with it. It is my choice. Change is a part of life. To stand still and refuse change is like a child holding his hands over his ears with eyes closed saying, “I can’t hear you – I can’t HEAR YOU! NANNY, NANNY BOO BOO!! !” Ridiculous, right? Unfortunately, the older I get I can honestly say that those things that used to sound appealing and fun – do not entice me anymore. Nor do I like things where I seemingly have no control. Yeah – I’m funny that way. None of us like to think we are leaving a part of ourselves behind. But in essence this is what we do when we embark on a new adventure. Change. That one word can alter everything. Dying to one life – entering into another. With no control – or at least it feels that way. So for all of you out there who are on the cusp of something great – or you simply don’t know where you are heading – but feel the winds of change, I hope that you will not feel alone. There is someone else out there in the blogging community that knows what you’re feeling and going through. Try to find the positive in change. Remember that change brings its own rewards – new friends, new situations to discover, new places to explore – lasting memories and a wonderful opportunity to use gifts you never dreamed you possessed. Don’t resist it. Go with it. Ride the wave – feel the melancholy, drink it in. And then – finally learn to embrace the impossible. Today was one of those rare beautiful days in Seattle – and a moment in time when all is “right with the world”. At least mostly. Pastor Greg spoke on “change” in the service this morning at the church we now attend in Enumclaw. It was really beautiful – and echoed what I myself have been feeling in my spirit now for over a year. Change is hard because I like to stay where I am – it is more comfortable and I like it that way. Change means a “pulling away” from the familiar. Change means being willing to “grow” and be “adaptable” to the new things around me. Change means saying “goodbye” to what I don’t want to. And means doing things I would normally never do. It can also mean allowing someone into my world that has hurt me – or forgiving those I thought I already had – and setting them free from any debt they owe me. As I pondered these thoughts from this morning – something really hit home to me and was like an “Ah ha” moment. I don’t think it was necessarily anything in particular that our pastor said – but something was stirring in my spirit. I have been on a journey of “change” – and a “new season” in my life for over a year now – and things are making more sense to me than ever before. Things are becoming clear to me in a way they never have before. I felt a couple of tears spill down my cheeks as I sat there in the stillness of that moment. I realized something: I am enjoying life. Really enjoying it – to the fullest. Moving past a difficult time – finding love in a new way – waving goodbye to the past. All of this is good. Mostly. But there will always be things I can’t understand. How things can seem to be “healed” and “right” one moment and the next – be completely silent, awkward and “wrong” again. I will never understand why people run and hide – instead of facing things in the right way. I will never understand how God can forgive me – and I can believe that I have forgiven my brother and yet others cannot seem to forgive me. And I will never understand how people cannot seem to forgive themselves. And so when I say that life is good – it does not mean I still do not have questions. I wish and pray with all my heart that someday I will have an answer to these and many more. As I drove to Seattle today with Greg after church and saw Mt. 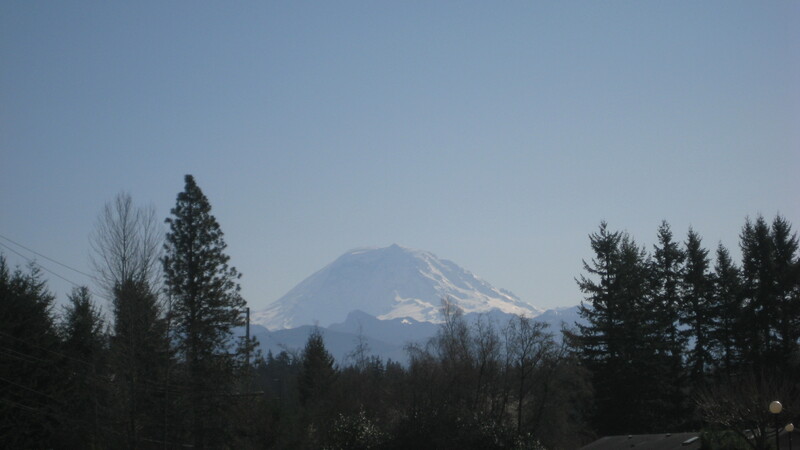 Rainier in all its beauty and splendor – I was awed and moved once again. One of God’s great gifts to me in tangible form – a beautiful day that will bring tears to my eyes every time. And reminds me…God is good – all the time. Like a kiss from heaven – He is making life beautiful for me – working behind the scenes of my life. And if He takes that much trouble to create a magnificent backdrop for me to just enjoy – like Mt. Rainier – how much more does He also care about my unanswered questions and struggles? Much, much more! He understands the things that drive me crazy! He gets me – even when I don’t sometimes “get” myself and He understands why I do the things that I do. Even when I don’t. He is not afraid of my questions. He understands my emotions and tears. He knows why I still have a “heaviness” in my spirit that I am trying to leave behind me. He knows about the unspoken events and hidden brokenness. And He is still there – working through all the “changes” in life that surround me. Even when I have a rare day of beauty – and all is “right in my world” Even when things in life are good. At least mostly.